Late last year Facebook released some astounding marketing data; they claimed that their advertising platform can take on TV at it’s own game. COO Sheryl Sandberg told press that Facebook have a potential audience of 3 Superbowls every evening – that’s an audience of 300 million, passively waiting for your video content. While some critics might consternate about the many, many obvious problems with Sandberg’s comparison (many Superbowl viewers actually tune in for the adverts themselves), there is a way to harness that audience. 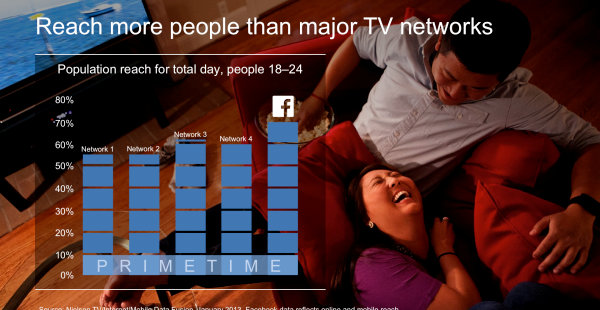 Facebook reaches 70% of 18-24 audience compared to 60% average for TV networks at Primetime. 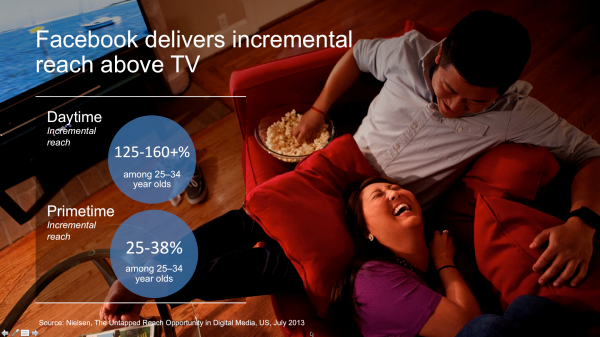 Facebook adds incremental reach to marketing campaigns above TV; for daytime a whopping 125-160%+ among 25-34 year olds. 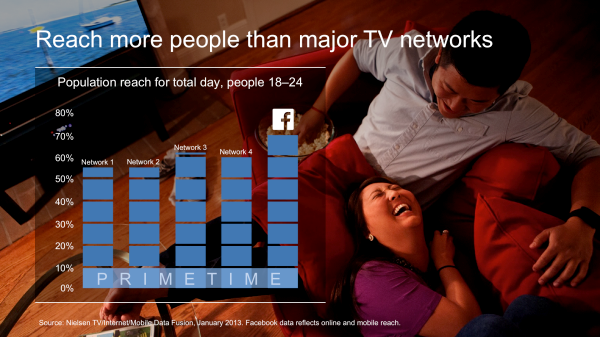 For Primetime Facebook sees an increased incremental reach over TV of 25-38% among 25-34 year olds. With audience figures like that it’s no wonder Facebook are fighting for those ad $, but the fight’s only half-way through. To truly kill off TV they need to battle people’s viewing habits and in particular make Facebook a better platform for viewing video. Users currently leave many ads untouched (ads have somewhere below a paltry 1% engagement on FB), so a more aggressive strategy is required. Much talk has centred around auto-playing ads (without sound), which will no doubt annoy mobile phone users who are constrained by a finite data allowance, or full-screen, 1 off ads that open before you can access your Newsfeed. Both examples have deep, inherent problems around UX. Currently Zuckerberg is witholding the exact detailing of how this new ad space will open up, but my advice would be to get better content on Facebook. The difference between internet ads and TV ads has often been down to quality. 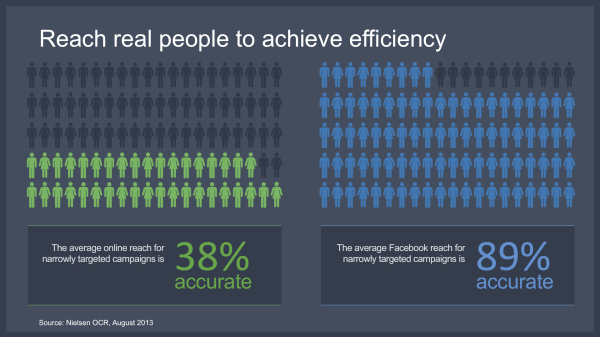 If you increase the quality of your ad you’re more likely to get the engagement it deserves. If Facebook can facilitate this for advertisers then maybe they can kill two birds with one stone, drawing in big advertisers and retaining some of that user experience they need to hold onto their audience. Facebook advertising is currently flawed; too few big fish coupled with too little engagement makes it often seem like an unnattractive prospect. But the potential for brands to connect with their audience is unparalled on any platform. The key to success, as it has always been, is to make your video content strongly relevant to your audience. Make it interesting, make it striking, make your audiences’ stomachs’ sick with laughing; use bold and brilliant copy with powerful calls to action – even ask your audience to share it (it’s no longer a crime). With the focus and precision that Facebook advertising allows you too can tap into that monster-sized audience, you’ve just got to get that audience to want to watch your video. Do you want to capture the true power of social? Combine great video content with an integrated marketing campaign through our V-AMP platform to reach your audiences. If you want to read more of our blog posts then add us to your RSS feed here, or follow us on Twitter for constant updates. Alternatively, email today to get a direct response and see how we can change your business.